Have you ever searched and searched … and searched and searched…. for that perfect piece of furniture for storage? I know I have spent (wasted???) many a morning and afternoon perusing furniture showrooms, thrift shops, yard sales, and antique stores on a mission for the right piece of furniture in the right size. Though nice to take an occasional break from Real Estate and work around the house, sometimes I just want “it” now so I can check it off of my perpetual “to-do” list (and get our clutter behind closed doors). I thought this was a great idea from This Old House Magazine (Photo: Wendell T. Webber) In fact, I am thinking beyond just a side board… kitchen island (make sure to finish the back side as well), baby changing table, TV console. There are so many different cabinet options in so many sizes. Combine that with cool hardware, premade legs/feet, and unlimited options in paints and stains. Keep it simple or get creative… there are no limits. In the end though you know your masterpiece will fit both your space and decor – plus you can say, “I did that” – how cool! Dishware, serving pieces, table linens—a sideboard packs a whole lot of storage space into a relatively small footprint, making it a handy addition to any household. A sturdy, high-quality one can leave a thousand-dollar dent in your finances, but as This Old House general contractor Tom Silva demonstrates, you can enhance a few stock kitchen base cabinets with molding, furniture feet, and knobs to produce a handcrafted piece for a fraction of the cost of buying one ready-made. Opt for unfinished 15- or 18-inch cabinets fitted with doors and operable drawers (not the fake drawer fronts used for sink cabinets) and take a day to put all the pieces together. Your handsome creation will turn heads at dinner parties for years to come. The design for this sideboard is based on one found in the book The Find, by Stan Williams. 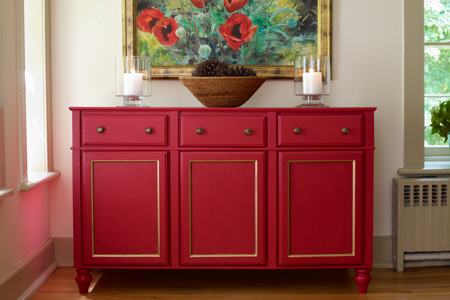 Paint: Fabulous Red in semigloss; Valspar. Rub n ‘Buff Metallic Finishes in Antique Gold; Amaco. Previous PostFeatured New Construction for $215,000! !Next PostBlack Bean Brownies – Yuck to Yum! !